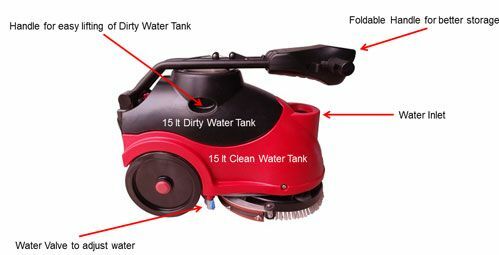 With this compact micro scrubber/dryer, you can easily clean the floors in narrow areas. The AS380/15 is easy to use and with handles on the side of the water tank is highly user friendly. The foldable handles makes it easy to transport and storage the machine. The adjustable handle takes the ergonomic needs if the user into consideration. Furthermore the AS380/15 is easy to service and maintain. You will find it ideally suitable for daily indoor scrubbing and drying in light to medium areas such as offices, hotels, hospitals, schools, smaller supermarkets and other retail outlet.